Steven Soderbergh is about the only filmmaker I have ever seen to direct no less than six films in less than two years and most of them, good films that warrant a watch. The list you ask? Okay real quick: The Last Time I Saw Michael Gregg, Contagion, Haywire, Magic Mike, Side Effects and Behind The Candelabra. I have seen all of'em except the first film (The Last Time I Saw Michael Gregg), which honestly I have never even heard of, (apparently it is out of Australia). Of all the films above, Side Effects stands out and for good reason. It is a slowly effective pot boiler about a mentally disturbed woman named Emily Taylor under psychiatric care whose mental state seems to unravel with the release of her imprisoned husband Martin (Channing Tatum in an unusual casting - seen also in Magic Mike). It's not that he is a bad sort. He has been in prison for insider trading and before incarceration they were living the high life. Now that he has been in, Emily has been reduced to a modest apartment with a little money but nothing more. She works for an ad agency but her mind is starting to buckle under all of the strain from life itself. After a failed suicide attempt, she is admitted to a psychiatrist, Dr. Jonathan Banks (a fantastic Jude Law). He starts her on some prescription meds that he has a sample of named Ablixa. Emily starts to sleepwalk and do some VERY strange things. When she lands in trouble with the law for a crime she may or may not have committed while under the influence of Ablixa, suspicion falls to Dr. Banks for his prescribing Ablixa to start with. That is all I can say without spoiling Side Effects. Side Effects is an effective urban drama, not flashy or abrasive - taking the science of mental instability, diagnosis and treatment with respect without becoming cheap or tawdry. Soderbergh does not feel the need to assault the viewer with odd or strange camera effects so common in a lot of films these days. He has a great script by Scott Burns to work with and these characters are all smart and well written. They behave out of natural instincts not forced storytelling and what happens to them is believable. Let's say, I cared what happened to all of them; even Emily's arrogantly bitchy former psychiatrist played with icy coolness that you could store meat in by Catherine Zeta Jones. Law's Dr. Banks is a good doctor, who cares about his patients even to the detriment of his marriage. What happens in Dr, Banks' life after Emily's crimes is handled effectively and subtlety and not overdone. 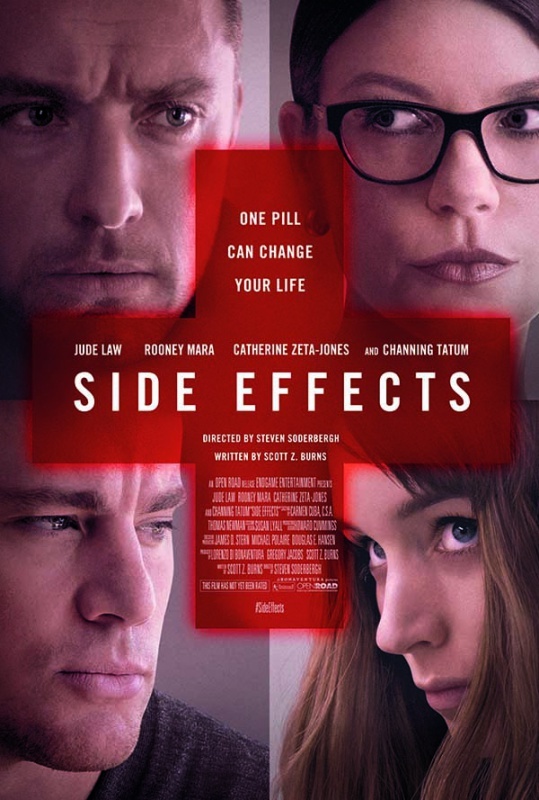 Soderbergh is a masterful director who knows how to construct an delicate subject as in Side Effects. He takes his time and lets this film build and build until the true intentions of all involved remedy the situation; believably and with dire consequences for some - the final act you will have to pay attention to because you will not see it coming. Side Effects will not appeal to all of you as it does take its sweet time in unfolding, but if you have the patience and time, you'll love the finale. Thomas Newman provides another stand out score with his music also being quiet but it pulsates enough to keep the film moving. His use of an orchestra, electronics and his choice of an eclectic array of odd instruments make Side Effects creepy and interesting. This composer is in my top five of all time and he has never disappointed me. If you have the means, get the soundtrack.